These are the first photos of Microsoft's Project Pink phones, snatched from deep within the bowels of the Microsoft/Verizon industrio-complex —not the Turtle, but the larger, Sidekick-like Pure. 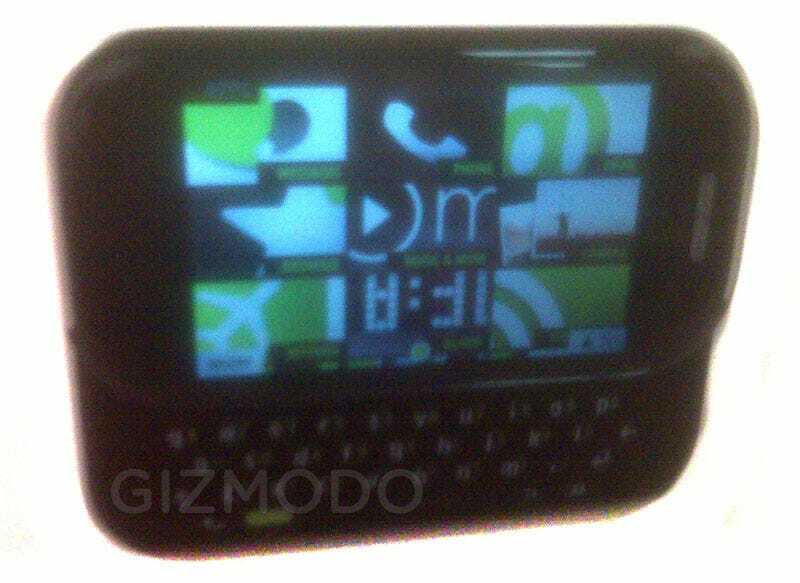 This doesn't look like Windows Phone 7, so what is it? The shots come just hours after a leaked advertising campaign for the Turtle outed Verizon as a carrier for the Pink Turtle, without so much as a mention of the Pure. Our tipster confirms the Pure is also headed to Verizon, but doesn't have a release date. (Though it's hard to imagine the release date would fall too far out of line with the Turtle, which is expected to hit stores at the end of April. Business Week's claim that the release will be May or June of this year supports this.) Anyway, this thing: It's strange! It's got a paneled interface, with fixed squares for everything from music (with Zune typography) and email to RSS feeds and what looks like a unified social networking hub. As hinted earlier, the aesthetic is similar Windows Phone 7, but the software is distinctly not Windows Phone 7. This looks like Windows Phone 7: Feature Phone edition. Our source got a few seconds to use the Pure, and said it was intuitive, "better than Android," and decorated with Windows Phone 7-style animations throughout. That said, the app situation still doesn't add up. There's apparently an download screen for new apps, but it's not populated with anything yet. This could mean two things: Either the Pink phones will tap into the Windows Phone 7 marketplace somehow, which would be great (but also doesn't make sense), or they'll have apps like the Zune has apps—which is to say, only sort of, and only from selected partners. The more we see, the more the Pure and Turtle look like they're stacking up to be Zune-ified followups to the Sidekick. It's an interesting move, but who does Microsoft think they're going to sell this thing to? Tweens? We've got our hands on leaked Pink firmware, and we've dumped all the icons and photos we could extract. Sadly, there's not way to run this right now, but we can see a lot of what's shown above, like the homescreen application icons, in full resolution. There are also traces of Zune, as well as Facebook, Twitter, Yahoo, and Windows Live. There are some shots (discovered by someone else who's got the firmware) that show a lockscreen dialer, but these are likely placeholders of some sort. Also tucked away in the firmware are default wallpapers for both phones, in their rumored resolutions. Finally, we've got a shot from the Turtle's unremarkable camera, which appears to have flash. • The carrier is definitely Verizon, though there are references in the firmware to AT&T and T-Mobile in the US (which are probably placeholders, since the rest of the evidence points to CDMA radios as standard for these phones.) There are also references to a wide range of foreign carriers in the UK, mainland Europe and Asia, but again, most of these carriers don't support what looks like the initial version of the handset's CDMA hardware, as far as I can tell. Everything is programed in .NET a lot like 7 is. It does not say it inside the files where I have seen, but It is coded in XAMl and is in the structure that CE 7 is supposed to be structured, it is my belief that it will be based off CE 7, and it will have a lot of tie in to Windows Live as well. • Turtle and Pure codenames are used in the firmware, but that doesn't mean that those'll be the shipping names for the product. There are also codenames for the "Pride" and "Lion" handsets, which appear to just be the international versions of the Turtle and Pure, respectively. • The Turtle's screen is 320x240, while the Pure's is 480x320—the same as the iPhone. • There are reference to something called "The Loop," which sounds like some kind of central social networking hub.